When you start to think about building a new log home, it's nice to know that you don't have to start from scratch. It's also nice to know that you aren't alone. 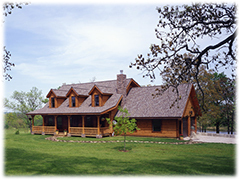 Honest Abe Log Homes offers many choices in log home packages. These selections make the planning and building process more understandable and less stressful for the first-time home builder. Like any future homeowner, first establish some basic guidelines. The budget is probably the most important. Find a price range you're comfortable with to help narrow down the selection. Next, decide on the total square footage for your log home. Lastly, choose a log profile. The profile is the determining factor in the overall look and feel of your new home. Now you're ready to choose or design your floor plan and begin looking at different packages. Honest Abe Log Homes is dedicated to working with you through every step to achieve your desired home. "Here at Honest Abe, we strive to have the best quality in every process from log manufacturing to providing blueprints and construction guides," said Fred Kendall, the design manager and a 25+ year employee at Honest Abe's headquarters in Moss, TN. "Honest Abe offers more complete packages than many companies. When comparing price, it becomes clear that we have a larger quantity and more quality materials to include in our packages." "The customer usually comes to us with ideas on how they want to finish their homes and where on the property they want their home placed. Our representatives are here ready to advise on things related to what the customer wants in a particular package and how Honest Abe can provide those materials," said Kendall. A Honest Abe log home package is more than just a group of building materials. Each one is someone's dream, and unique in its contents. Like other high-end purchases, log home packages are specific to your wants and desires. Honest Abe offers you a variety of choices. From only logs to a completed outside shell structure, the decision is up to you as to what type and how many materials Honest Abe provides. Honest Abe makes you the top priority when planning out each step of a log home design. This means that Honest Abe offers construction seminars, supplies building guides, provides blueprints, and is ready to answer any questions. For nearly 30 years, Honest Abe has been there to support it's customers in creating their dream homes. Whether it's a modest cabin or a palatial retreat, talk with Honest Abe about your vision and turn your fantasy home into a tangible reality.